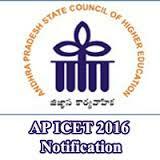 APICET- Andhra Pradesh Integrated Common Entrance Test 2016 will be conducted by Andhra University on behalf of APSCHE for admissions into first year MBA and MCA courses. Eligible candidates applying for ICET 2016 submit applications online. APICET 2016 Registration fees is Rs.350/- can be paid @ AP Online centres or through payment gateway Debit, Credit card and Net banking.